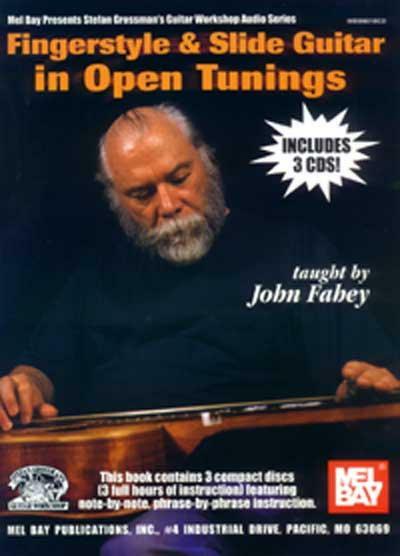 John Fahey was a pioneer in composing and arranging guitar solos in open tunings. In this lesson series for the intermediate guitarist, John teaches a wide variety of techniques, musical textures and styles. The book includes the notation and tablature for the lessons plus 3 compact discs featuring phrase-by-phrase instruction. LESSON ONE: Open G tuning: On the Sunny Side of the Ocean, Spanish Two Step and It Came Upon A Midnight Clear. St.Louis Blues played in a dropped D tuning. LESSON TWO: In this lesson John explores the possibilities of playing in an open C tuning. The Union Pacific has a distinct blues quality, Requiem For John Hurt has an "Eastern" feel. Simplicity often creates beauty and John does this with his version of Auld Lang Syne. LESSON THREE: This lesson concentrates on John's slide guitar playing. Steamboat Gwine Round The Bend played in open G demonstrating many of John's unique technical ideas. The Christmas carol Silent Night is presented in the slide style. John's popular arrangement of Poor Boy A Long Way From Home played in open D tuning finishes the series.